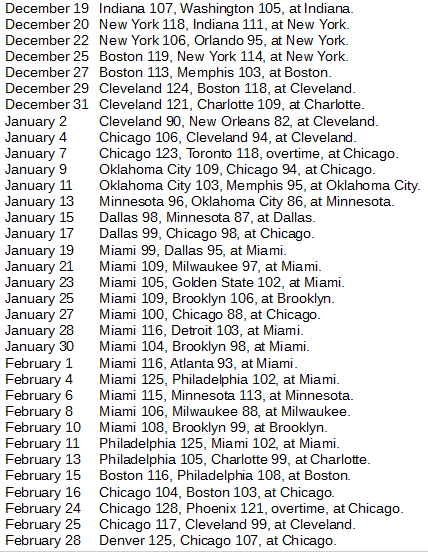 The Miami Heat tore through the end of January and the start of February with 12 straight wins for the traveling championship across pro basketball, good enough for Team of the Year honors. But the Clippers put up a strong run at the end. Goran Dragić was the game-high scorer four times and the high assist man five times during the Miami Heat's 12-game run with the traveling championship across pro basketball (Keith Allison/Creative Commons Attribution-Share Alike 2.0 Generic license). The traveling championships aren't intended as a measure of which teams across any league are the best. After all, there is some luck involved in even getting the opportunity to play for it. For example, it's pretty hard to argue right now against the Golden State Warriors as the best team in pro basketball. The Warriors won 15 of their last 16 regular season games, and now they've won all 13 of their playoff games. That's 28 wins in their last 29 games – absolute gold star dominance during the most important part of the season. 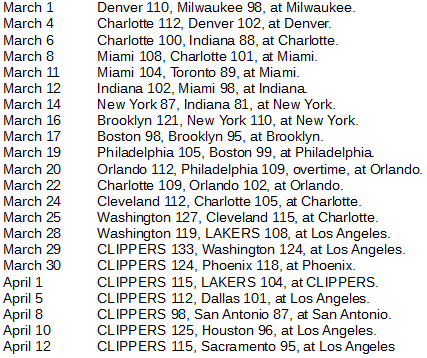 Where the traveling championship of pro basketball this year was concerned, the Warriors were a non-entity. Nothing against them. They just didn't have a lot of chances. The Warriors played for the continental traveler only once, losing 105-102 on the road against the Miami Heat on January 23. How would the traveling title have gone differently if Golden State had won that one opportunity? It's hard to say. But we do know this: The Heat was hot at the time. The Miami five had already won two straight with the traveling title, and would go on to win nine more in a row after that contest. With that run of 12 straight wins for the traveling title, the Heat comes out as the overall Team of the Year, finishing the year 15-5 for the championship with three titles and 12 defenses in 15 attempts. During that run of 12 straight traveling title wins for the Heat, the star was Hassan Whiteside, who was the high rebounder in seven of those games and the high scorer in two. 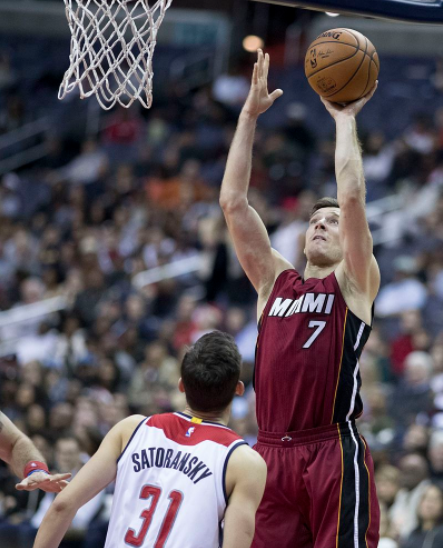 Another stalwart was Goran Dragić, the high scorer in four games and the high assist man in five. A strong case could be made for the Clippers who finished 9-1 with two titles, including a seven-game streak that ended the regular season. The Clippers will take the title to the start of the 2017-18 campaign. 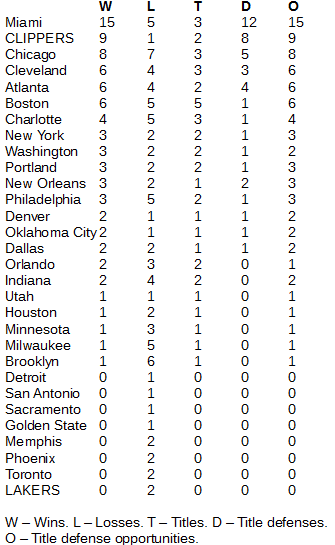 All-time, the Warriors remain the all-team leader with the traveling title. After their 40-2 performance with the prize in 2015-16, the Warriors now are 40-3 overall. The Warriors have actually only won it once. They were the care-taker champs when this exercise began with the start of the 2015-16 season because they won the NBA title the year previous. Then, the Warriors tore off 24 wins before finally losing the title. The Heat, though, has a way with this continental title. It now has won the seven times in two years, far more than any other team. The Heat is 22-10 in games for the league-wide traveling championship, making them second in all-time wins. 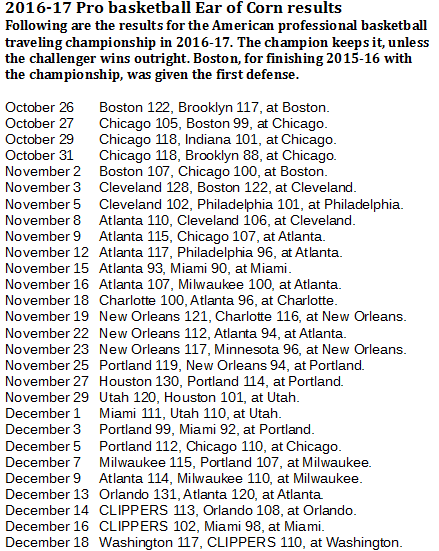 The Heat has successfully defended the title 15 times in 22 attempts during the two-year history of the championship.